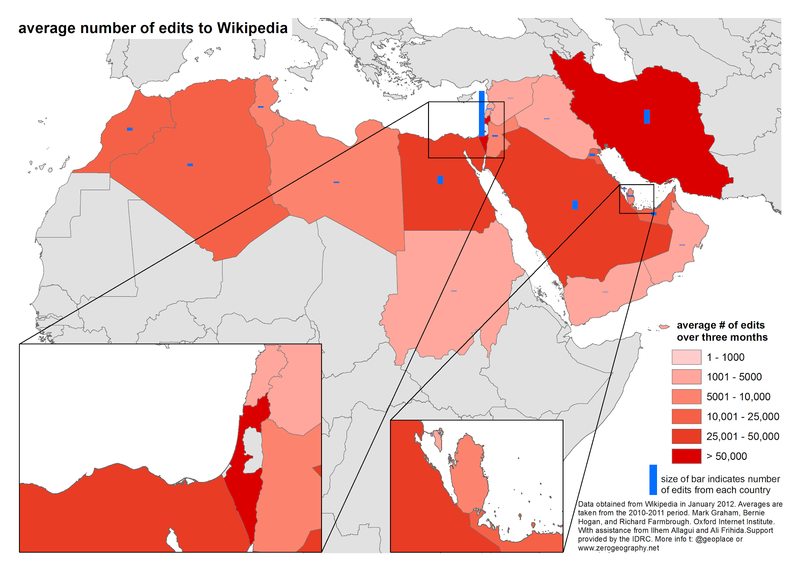 Where do Wikipedia edits come from? Our team recently decided to look at the origins of edits to Wikipedia articles. The results are striking. 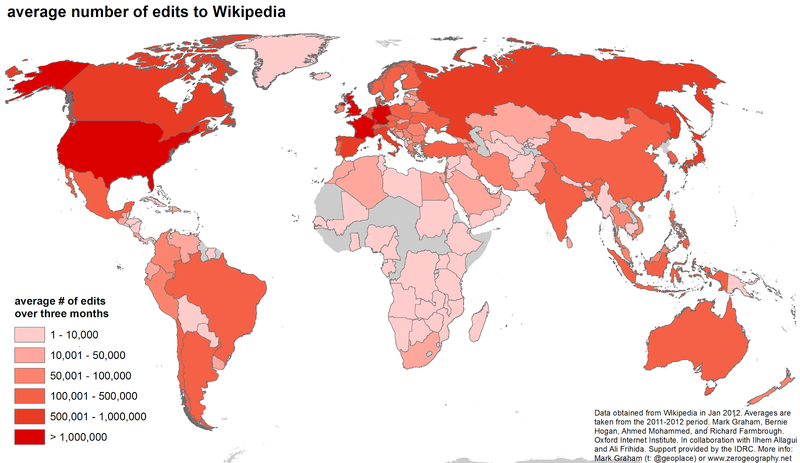 But given what we already know about the uneven geographies of Wikipedia are perhaps not that shocking. To make these maps we took quarterly data about the total number of edits (to all Wikipedia versions) to emerge from any territory (i.e. the amount of content that people are producing in each country) and averaged it over a two year period (2010-2011). The inequalities in the amount of content produced are stark: the US, Germany, the UK and France all have an average of over a million edits each quarter. But then you get most of Africa and the Middle East where the average number of edits per quarter is only a few thousand. Interestingly, there are more edits than originate in Hong Kong each quarter than the entire continent of Africa. Much of this variation can actually be explained by Internet population (i.e. the total number of Internet users in a country). However, even accounting for their generally low Internet populations, most countries in the MENA region and Sub-Saharan Africa still fall below their expected number of edits (we are currently working on some statistical models and writing a paper about this topic). Zooming into the MENA region, the scale of some of these disparities become even more clear. In the map above, you can see that there are almost as many Wikipedia edits that come from Israel (215,333) as from the rest of the entire region combined (254,089)! Finally, it might also make sense to look at the number of views per edit in the region. This gives us a sense of how much consumption vs. production of information is happening. Israel again stands out with fundamentally different characteristics from the rest of the region. 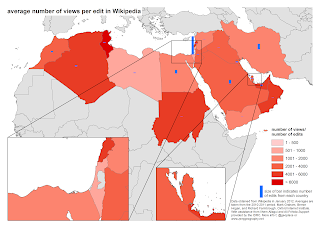 In Israel their is much higher rate of information production on Wikipedia (as compared to number of views/consumption) than many of its neighbours. Libya and Iran also score well in this regard. In the case of Iran, we also see a lot of edits originating in the country (Iran has the second highest number of edits in the region). With Libya, it may also be the case that there is genuinely a high number of edits per views: but we may also be dealing with rounding errors given the very small number of both views and edits that we see in the country. As always, there will be more maps and analysis up here soon. But I wanted to share these and ask for thoughts and comments as we start writing our paper.